Approximately 3 months ago Ali Alsaiyari and I (Jason Fletcher) were exploring the desert next to the industrial city of Al Kharj. We were 15 km off the highway doing a bit of 4 wheel driving when we came across a Dahl. As we were not expecting to go caving this day we did not have any caving gear with us so we were unable to go into the cave. We kept the coordinates for the chance to come back in a few weeks to explore the cave. 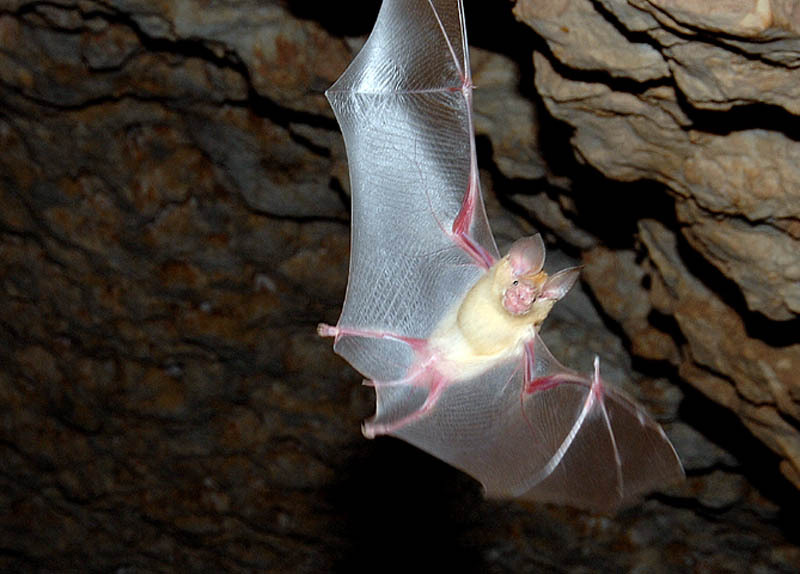 We noticed a few bats even in the middle of the day near the entrance of the cave. The cave entrance. 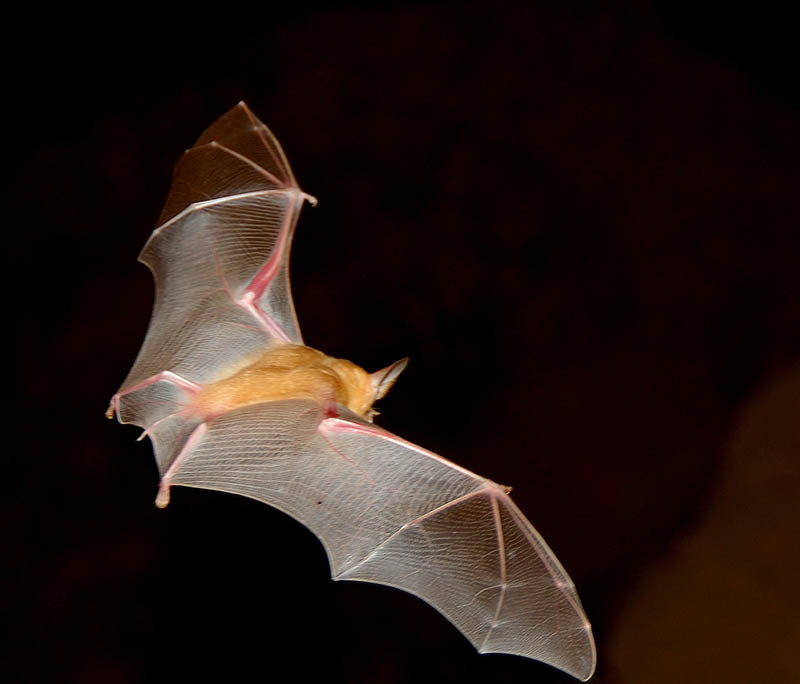 Bat-filled passages lead off in two directions. A couple of weeks passed and I went with another friend to explore the cave. To my surprise it had a very large colony of bats. It was a very smelly experience. It was quite exciting turning off our head torches and having the bats fly around our heads. As Ali adjusts his chin strap the bats are flying all around him. I informed Lars Bjurström of my find and he was very happy as he wanted to film some bats for his documentary. I gave him the coordinates and he was able to get a few good shots. This weekend Ali and I went back to the cave to explore another section and this section was much longer than the first area we explored and also full of bats. I think after we were crawling on our stomachs in the dust and bat droppings for two and a half hours we decided to stop for this adventure and come back another time to get as deep into the cave as possible. It was actually a very physically demanding cave due to all the crawling and wriggling through the areas of the cave where the roof was just high enough for us to fit. 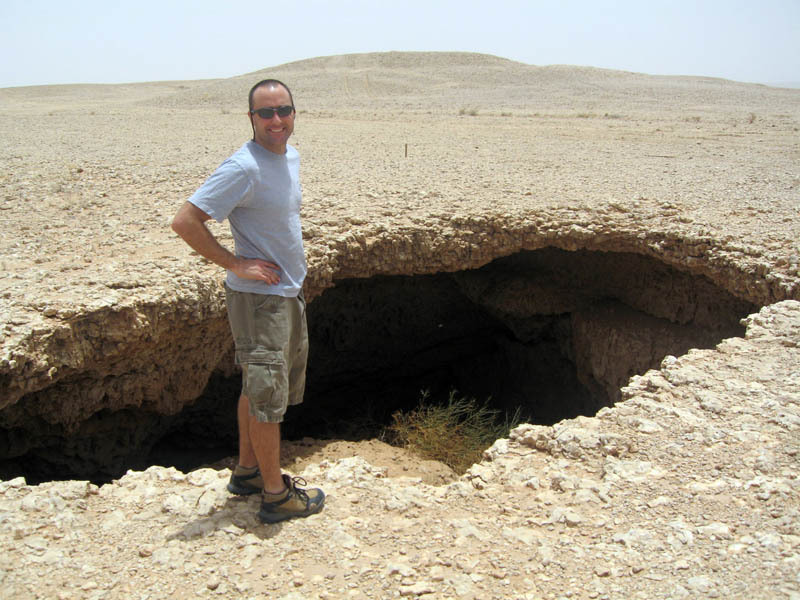 The entrance to this cave appears to be a collapsed section of the roof of the cave. Both sides of the cave that we have been exploring have long crawl sections some more than 30-40 meters long but as yet we have not measured them. The first section we explored had a long crawl section and then 3 larger chambers with high ceilings. It took only 15-20 minutes to find the final chamber. To get into the second section, you have to squeeze into a tight, 45-degree gradient. We have not gone everywhere in this part yet and we spent 4 hours mostly on our bellies with our back very close to the roof. I sustained quite a few abrasions on my back. This area of the cave has some rooms where the ceiling is up to eight meters high, but it mainly has many long, low crawl sections. 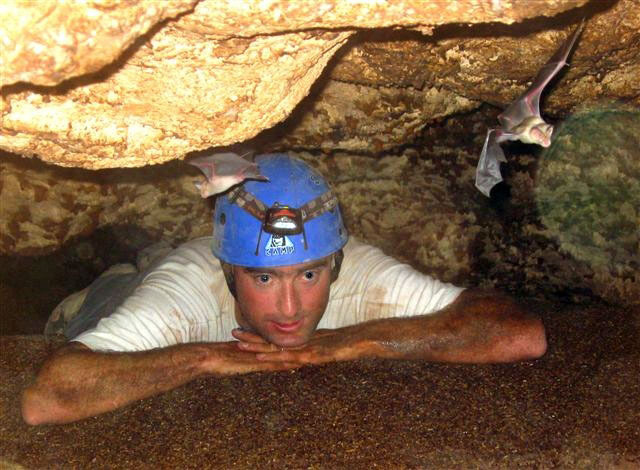 In some sections it was crawling over dry sand, in others it was bat guano. The depth of the guano I'm not sure of, and did not feel like digging to find out its depth! Jason on a bed of guano with bats buzzing about his head. In a couple of sections the dust was so fine, light and dry that we had to go one person at a time to do the crawl as so much dry fine dust was floating in the air. We were choking, coughing and sputtering for several minutes. I think we may take a simple face mask next time to save our lungs a bit. We definitely gargled a lot of water to clear our throats of the dust. 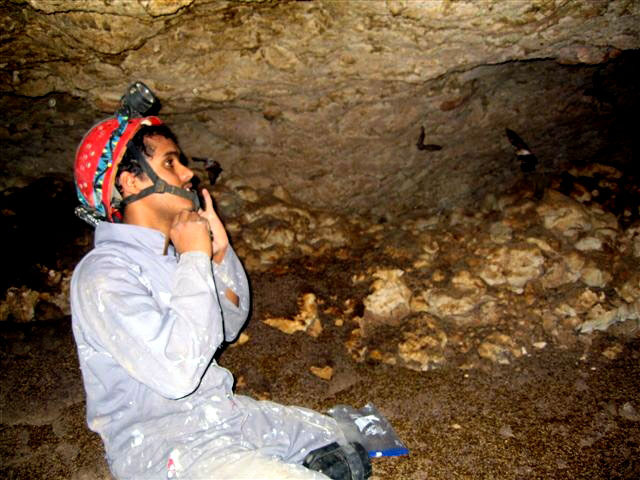 Ali's technique for avoiding as much dust as possible was to keep his head as close to the ceiling as possible whilst crawling to avoid breathing in the dust which he was disturbing with his hands and arms as he crawled along the cave floor. Another issue with the dust was that we had to wait 10-15 minutes for it to settle otherwise the photos wouldn't turn out, as the flash reflected off the dust particles. We haven't done any measurements yet, but hope to in the future.